I love everything about this salad as it pretty much combines all of my favorite foods. It’s also super easy to make! 1. Wash and cut a beef tomato (or any medium sized tomato) into approximately 8 slices. Arrange on a plate. 2. Take a mozzerella log and cut four medium thick slices. Then cut those slices in half so that you have a slice of cheese for each slice of tomato. 3. Wash and cut the desired number of basil leaves (4 leave if you aren’t a basil lover and only want half a leaf per tomato slice or 8 leaves if you do love basil). 4. Place a basil leaf on each tomato slice. Place the mozzarella slice on top. 5. Cut half an avocado into thin slices and then each slice in half (you won’t use the whole half, but can add more avocado if you’d like). Place each slice on top of the cheese. 6. 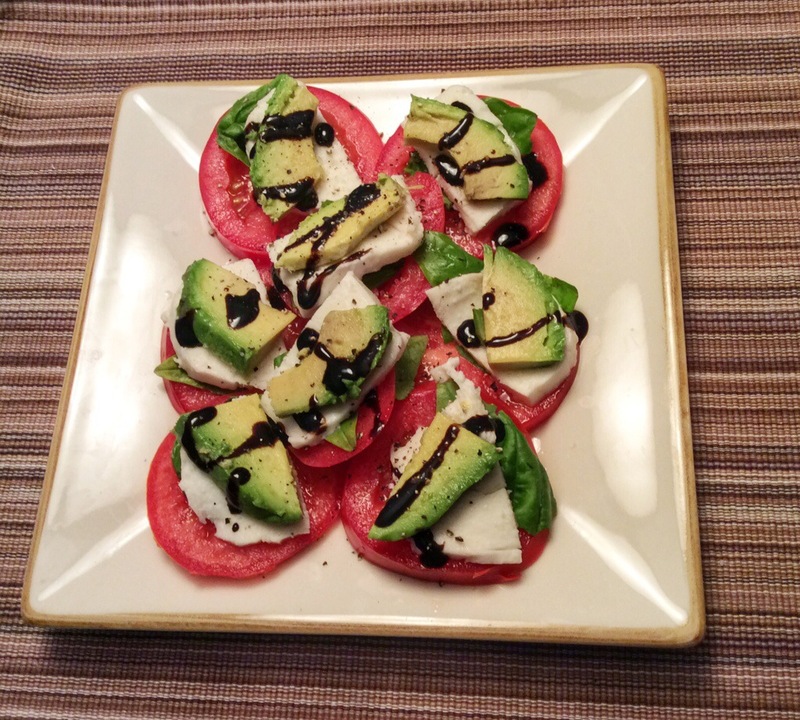 Drizzle balsamic glaze (or oil and balsamic vinegar) on top of the avocado.